The meeting point for Saturdays ride was Charring Cross, where a train would be taken to Gravesend. I was toying with the idea of cycling the 24 miles to Gravesend and meet everyone there but could not get up early enough to allow time for my woeful navigational skills. I therefore resigned myself to heading to Charring Cross. I arrived in pretty good time, mainly as the roads seems to be very quiet. Upon reaching Charring Cross I thought that I was the only Bromptonian there but saw that non other than Rachael Elliot, double Brompton World Champion had also arrived. Apart from going on an adventure the ride also had another purpose. As part of a forthcoming BBC television programme called, 'Fake Britain' which looks at fake good in the UK and the people who sell them, a cameraman had been deployed - along with a fake Brompton - to gather/film opinions. Rachael, who had a particular dislike of such items wanted to be part of it. Regular readers will know that I usually pay a visit to Charring Cross, late at night when attending a Friday night coast ride. Thankfully, things were a great deal tamer, apart from a lady near WH Smiths screaming about trains? One by one participants started to appear and before long we were on a train bound for Gravesend. The journey was not too long and as most commuters seemed to be travelling into London rather than out of it, we had the carriage pretty much to ourselves. Upon reaching Gravesend, we were greeted by Geoff who had met us there and we were soon on our bikes and off for another adventure. Almost immediately the river Thames could be seen falling into view. I have cycled a great deal along the first part of our ride before but under the cover or darkness on one of the Friday night rides, perhaps bound for Whitstable. It was nice to actually see what it all looked like in daytime. The first few miles were off road on various cycle paths. On a night ride I recall on one of these hearing marsh frogs croaking away in a stretch of water running adjacent to the path and straining my neck towards the heavens to see the International Space Station travel by. The light hitting the clouds produced picture postcard views. I would have liked to have stopped and taken lots of photos, but this was not that sort of ride and I had to do my best taking them while riding my Brompton. 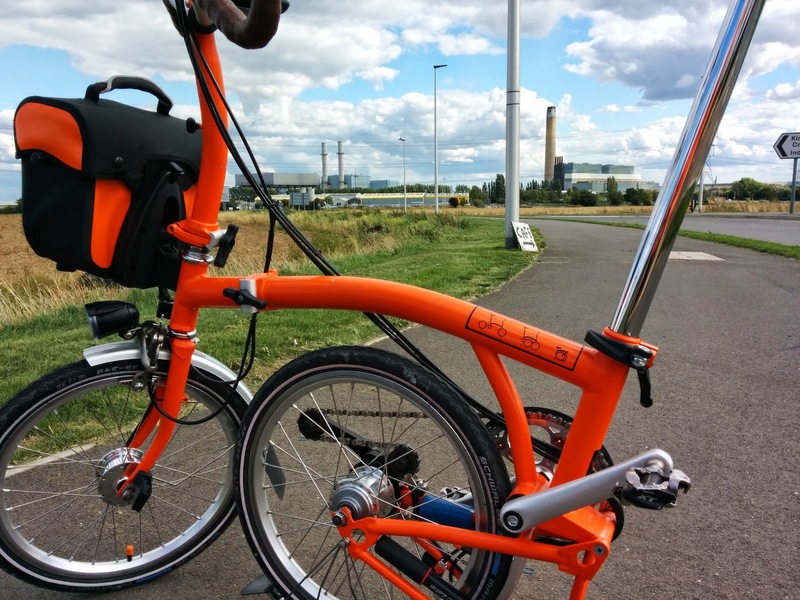 Again, I took my all new P Type Orange Brompton and I have to say that I am pretty pleased with it. Already I have clocked up quite a few miles on it and next week I will be taking it to Brompton Junction for its initial service and checking over. The scenery was very pretty but every so often, towers, storage facilities and ships betrayed the industrial importance of this part of the river Thames. After only 10 miles we stopped off at a pub (whose name escapes me) in Cliffe where we also met up with the BBC cameraman. Not wishing or interested in being part of the filming I wasted no time in ordering luncheon. 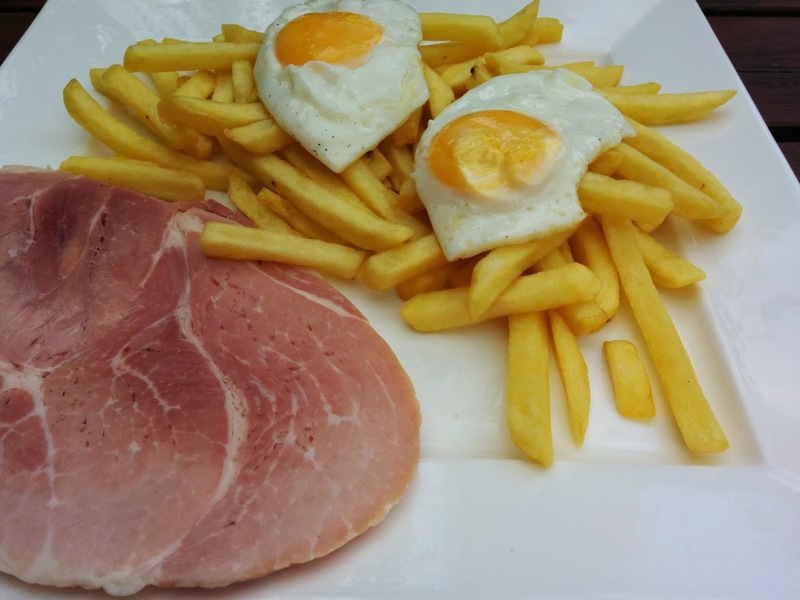 It was a pretty mean ham, eggs and chips and I ate it with enthusiasm while the filming took place. Rachael was first to offer her opinions of the fake Brompton. I don't know if the definition of a fake Brompton would mean that it would have to be a fake Brompton with a Brompton decal sticker on it but this bike was unashamedly based on Brompton. People quite rightly offered detailed and thorough assessments of what they thought of this bicycle. Not being someone who minces my words, my assessment would have been much shorter, blunt, to the point and could have been summed up in just two words...total s*#t!! Having had the opportunity to visit the Brompton factory a few times - last week in fact - I have seen a Brompton being built. The level of skill, attention to detail in making a Brompton as well as quality components make you appreciate that you have indeed bought a hand build bike. The thing - the only word I can use to name it - the BBC man brought was total rubbish. It looks like rubbish doesn't it! 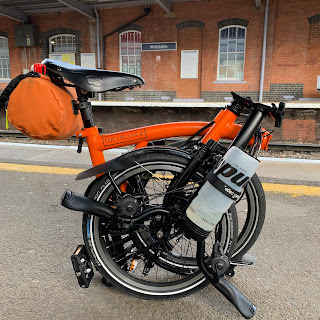 I have been on many adventures on my beloved Brompton bicycles and because of their supreme quality I have always felt confident that my journey will be safe, comfortable, and achievable on my Brompton - whatever that journey may be - commute, race, touring...the list goes on and on. Comparing the real thing to that piece of @$%! A few had a go at riding it - many just didn't want to me included - and this aspect was equally as rubbish. I have to say that I am not sure who would buy this bicycle or whether Brompton have a problem here? People buy Brompton bikes for lots of reasons but a major factor in the purchase is that they are build to last and withstand just about anything. You only have to read some of my adventures to appreciate that. If you bought a fake posh watch for example it might have the looks and fool a few people, which is perhaps all someone buying such an item wants. 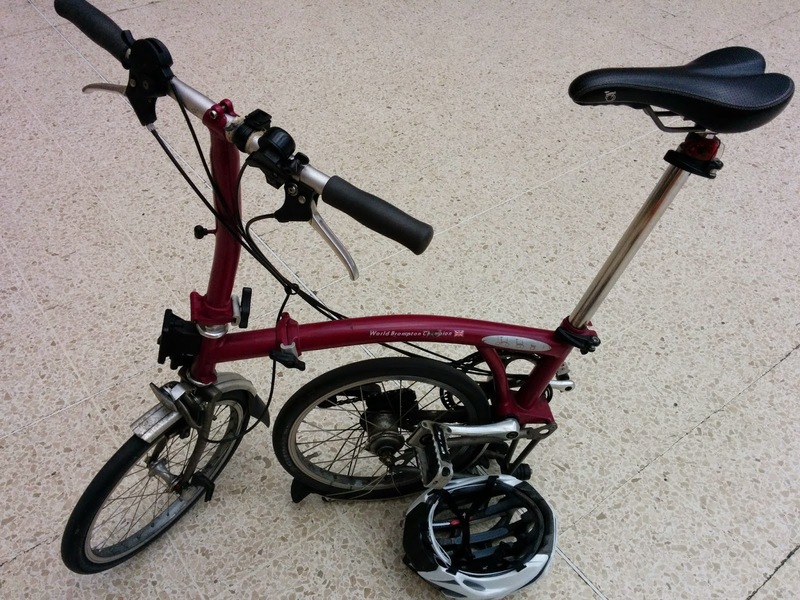 I am not sure why someone would buy a fake Brompton? You would want to actually use it and as soon as you did...it would be game over. The filming took ages and eventually we left the pub to continue the ride. As such it meant that a slightly longer version had to be abandoned until another time. I am told that the actual programme will go out in January. For the several hours the cameraman spent with us, his footage will account for approximately 90 seconds!! There was quite a strong headwind which made the pedalling that bit harder and a 37 mile ride felt like a great deal more. There was one section where we strayed on to a main road. It was an 'A' road but as it was a three lane carriageway on which the national speed limit applied, it felt like at motorway. I pedalled hard as I wanted to get off it as quickly as possible...it wasn't pleasant. Sanctuary came in the form of a slip road. I get pretty wary about being on such busy roads and was glad when we returned to quieter lanes. With signs for Gravesend we pressed on and made the final push. Arriving at the station we boarded the train for Charring Cross and had a good journey home chewing the fat. At Charring Cross we said our goodbyes and made our respective ways home. 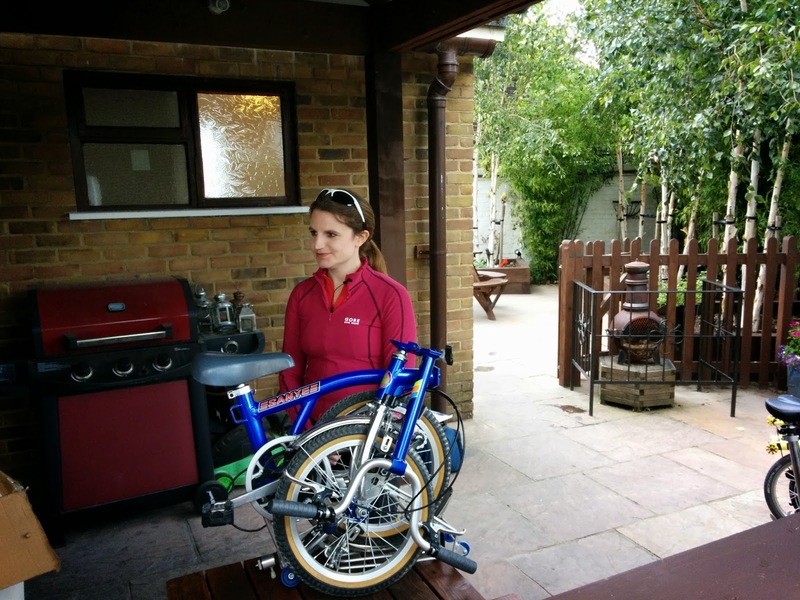 It was lovely to finally meet Rachael and it is not hard to see why she was a double Brompton World Champion! She spent most of the day up in front. As we were travelling from Charring Cross in the same direction I was behind her as she motored through Hyde Park. I normally zip through from Hyde Park Corner to Marble Arch pretty fast but Rachael was off into the distance and out of sight. Fast lady!! I am sure that Mark, who organised this ride will host another like this at some point. It was definitely an area to explore another time...without a BBC cameraman! Many thanks to Mark. My map and ride data can be viewed via the link below as can my interview with Rachael done some time ago. I am shocked to see that fake Brompton. I know there are many copying outfits. I wouldn't buy a fake Panerai or a fake Brompton. Nice revealing report, Mr. O! It's a form of flattery, i suppose, i don't know who the market is aimed at presumably people that want one? Just buy the real thing because that is what you will end up with anyway and it would have cost more with the purchase of the 'copy' and who will buy that off of you? I can't even find a link on Google! I don't condone buying or using fake products but I can see why people may buy things like clothes, jewellery accessories that are fake designer labels. Any inferior quality issues are not going to cause injuries. However, buying a fake cycle is pretty dangerous. Often the fake brands will have been put together far below UK/EU regulation safety levels. So while visually it may look like the real thing, you're risking some serious injuries if the integrity of the bike fails during a critical time. The engineering of a Brompton is unbelievably high but if a new Brompton is out of your price range then I would definitely recommend buying a 2nd hand Brompton. Even buying a cheaper folding competitor like a Tern/Dahon would be better than buying a fake product. At least those bikes will have passed certain legal quality standards. It's also worth noting that if you buy a 2nd hand Brompton and then sell it after a few years, you probably wouldn't have lost that much money. They hold their value really well.